Multi-Bag Filters to remove fines in the water 5 micro in sizes and to protect the filters form damage. Our basic design is a 5 stage multi filter capable of processing 750 gpm without shutting down the system while changing out filtration bags. Standard sizes from 30 gpm to 1000 gpm in a lead lag configuration. 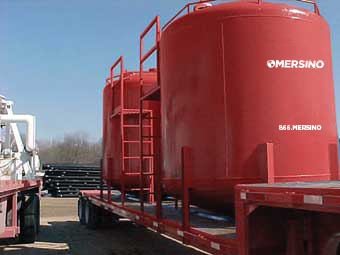 Most requirements require a secondary tank (lag) to ensure the absorption of contaminates in the groundwater. For higher flow, additional tanks would be added to the system. All piping/hoses from the pumps to discharge are pressure rated. Whenever we can, a closed loop system is installed to minimize any risk of releases. Sediment Boxes provide a 20 minute retention time. 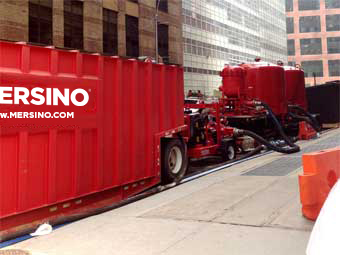 Portable sizes range from 2,000-22,000 gallons, while build on site temporary sediment boxes can hold up to 1,000,000 gallons.